The Wilson Fierce BLX 133g Squash Racquet. It features Basalt & Linear Geometry BLX technologies. A unique design allows the Fierce BLX to give its owner ample power, feel and control with a user-friendly, lighter weight. Sets the new standard for the next generation of power players. The technology and design that's gone into the Wilson Fierce BLX squash racquet is more ingenious than you can imagine - it's all about grace, power and control. The ideal squash racquet should feel like an extension of your arm, and be comfortable to hold in your grip. You get that and more with this lightweight racquet which also gives you smooth and precise strokes. Basalt fibres wind down the Wilson Fierce BLX, providing you with a sensation of natural manoeuvrability and thus eliminating the need to surgically attach the racquet to your arm for that perfect swing. You would have to be insanely dedicated to squash for that! According to Wilson, the linear geometry of this racquet enhances steadiness by 35%, so you can be super confident as you play and smash your opponent. 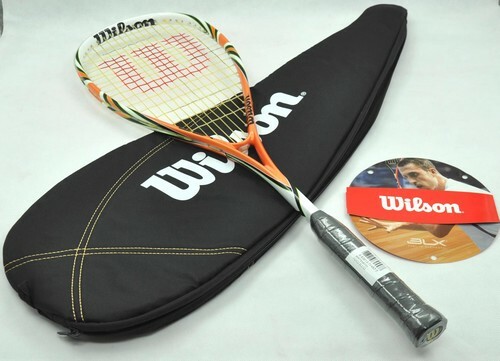 The Wilson Fierce BLX Squash Racquet is perfect for the intermediate player. The superior and comfort focused design is one you can put your trust in, giving you the ability to reach maximum performance for a powerful strike every time.